Education is dangerous. It is enough if they can count up to one hundred. At best an education which produces useful coolies for us is admissible. Every educated person is a future enemy. Martin Bormann (June 17, 1900 – May 2, 1945?) was a prominent Nazi official. He became head of the Party Chancellery (Parteikanzlei) and private secretary to German Führer Adolf Hitler. He gained Hitler's trust and derived immense power within the Third Reich by controlling access to the Führer. As World War II came to a close, Bormann held out with Hitler in the Führerbunker in Berlin. On Apriil 30, 1945, just before committing suicide, Hitler urged Bormann to save himself. On May 1, Bormann left the Führerbunker with SS doctor Ludwig Stumpfegger and Hitler Youth leader Artur Axmann. The International Military Tribunal at Nuremberg tried Bormann in absentia in October 1946 and sentenced him to death. In 1998, a test identified Bormann's skull, using DNA from an unnamed 83-year-old relative. Quoted in "The Trial of the Germans: An Account of the Twenty-Two Defendants Before the International Military Tribunal" - Page 101 by Eugene Davidson - History - 1997. Quoted in "The Columbia Dictionary of Quotations" - Page 446 - by Robert Andrews - Reference - 1993. Quoted in "The Third Reich Sourcebook" - Page 440 - by Sander L. Gilman and Anson Rabinbach - History - 2013. My darling girl, Unfortunately this earth is not a fairy-land, but a struggle for life, perfectly natural and therefore extremely harsh. All the same, or precisely for this reason, it is happiness and comfort for us men to have a precious sweetheart - and I have the most precious, the dearest and best of all! Quoted in "The Columbia Dictionary of Quotations" - Page 873 - by Robert Andrews - Reference - 1993. Situation very serious... Those ordered to rescue the Führer are keeping silent... Disloyalty seems to gain the upper hand everywhere... Reichskanzlei a heap of rubble. Wired message to General Admiral Karl Dönitz, April 28, 1945. Even among so many ruthless men, he stood out by his brutality and coarseness. He had no culture, which might have put some restraints on him, and in every case he carried out whatever Hitler had ordered or what he himself had gathered from Hitler's hints. A subordinate by nature, he treated his own subordinates as if he were dealing with cows and oxen. Next to Himmler the most sinister member of Hitler's entourage was Martin Bormann. He was a thick-set, heavy jowled, disagreeable, conceited and bad-mannered man. He hated the army, which he regarded as the eternal barrier to the limitless supremacy of the Party, and attempted, with success, to do it harm whenever he could, to sow distrust, to prevent necessary measures from being taken, to drive all decent person away from Hitler's entourage and from positions of authority and to replace them with his creatures. Bormann saw to it that Hitler was not kept informed of the real internal political situation. He prevented even the Gauleiters from seeing Hitler. Thus a grotesque state of affairs by which the Gauleiters- in particular Forster of West Prussia and Greiser of the Warthegau- came for me, the representative of the military they so distrusted, and asked for my help in arranging that they be allowed to see Hitler since Bormann consistently prevented them from obtaining interviews through normal Party channels. The sicker that Hitler grew and the worse the military situation became, the fewer were the number of people who could reach the dictator. Everything had to be done throug this sinister guttersnipe, Bormann, and thus his methods became increasingly successful. I had repeated angry altercations with him, because over and over again he would sabotage the taking of necessary military measures for the sake of the obscure political game that he was playing. He would also attempt to interfere in matters that purely concerned the Army, always with unfortunate results. 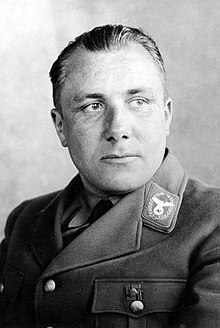 Bormann was the éminence grise of the Third Reich. The powerful men under Hitler were already jealously watching one another like so many pretenders to the throne. Quite early there were struggles for position among Goebbels, Goering, Rosenberg, Ley, Himmler, Ribbentrop, and Hess. Only Roehm had been left by the wayside, and before long Hess was to lose all his influence. But none of them recognized a threat in the shape of trusty Bormann. He had succeeded in representing himself as insignificant while imperceptibly building up his bastions. Even among so many ruthless men, he stood out by his brutality and coarseness. He had no culture, which might have put some restraints on him, and in every case he carried out whatever Hitler had ordered or what he himself had gathered from Hitler's hints. A subordinate by nature, he treated his own subordinates as if he were dealing with cows and oxen. Albert Speer, from "Inside the Third Reich: Memoirs" - Page 87 - by Albert Speer - Nazis - 1970. William Stevenson, 1973, from "The Bormann Brotherhood".